This is our elegant multi-storey wooden flower racks. This charming flower plant stand adopts the durable natural wood construction, which is very sturdy .This multi-functional flower rack not only is a flower rack, but also can be a bookshelf, display stand, shelf, decorative stand, etc. This multi-storey flower rack with high and low layer design, is able to place enough pots of plants. It can be placed your favorite potted plants or your shoes, handbags and other items. Perfect for any place, balcony, living room, outdoor and so on. This beautiful flower rack will decorate your home, deck, or patio. Don't hesitate to buy it now ! ❃Giantex Wooden Plant Flower Display Stand: This charming flower plant stand adopts the durable natural wood construction, which is very sturdy. ❃Multi Use: This multi-functional flower rack not only is a flower rack, but also can be a bookshelf, display stand, shelf, decorative stand, etc. 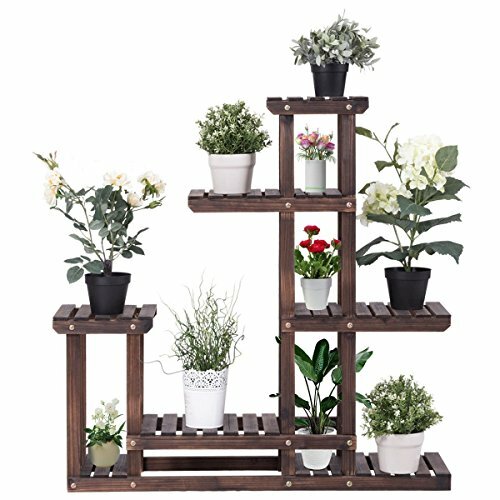 ❃6 Wood Shelf Storage: This multi-storey flower rack with high and low layer design, is able to place enough pots of plants. It can be placed your favorite potted plants or your shoes, handbags and other items. ❃Sturdy Construction: Flower frame with high quality fir wood , smooth and no burr, mildew moisture, easy to care, wipe.